Part of the New Zealand Mounted Rifles Brigade of the New Zealand Expeditionary Force. The Otago Mounted Rifles Regiment was one of four regional mounted rifles regiments raised to serve overseas in the New Zealand Expeditionary Force (NZEF) during the First World War (the others were the Auckland, Wellington and Canterbury regiments). It never served as part of the New Zealand Mounted Rifles Brigade (which required only three regiments), but was maintained as a stand-alone unit. The OMR served as part of the New Zealand and Australian Division on Gallipoli in 1915, before being reduced in size in early 1916 and renamed 1st Otago Squadron. In April 1916 it moved with the New Zealand Division to the Western Front, where it formed a composite regiment with several Australian Light Horse squadrons. Initially part of I Anzac Corps it joined II Anzac Corps in July 1916 as part of the 2nd Anzac Corps Mounted Regiment with Australian troops. Another reorganisation in early 1918 saw the OMR become part of the XXII Corps Mounted Regiment. 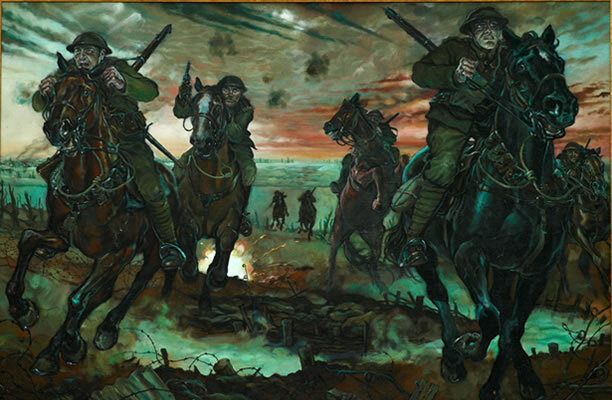 The static trench warfare of the Western Front provided few opportunities for the squadron to serve as mounted riflemen. They served as infantry in the trenches near Fleurbaix from July to September 1916, before moving into labouring work. They finally got to serve on horseback at Messines in June 1917, but spent the rest of the year in labouring and navvy work, including during the Passchendaele offensive. They joined in the defensive battles of the German Spring Offensive of March–June 1918, fighting both on horseback and on foot. They supported French troops on the Marne in July and British troops on the Somme soon afterwards, participating in the Advance to Victory until the final day of the war. The Otago Mounted Rifles Regiment was never issued with a cloth patch. Shoulder title worn by all mounted rifles units. The green-on-kahki puggaree (hatband) worn by all mounted rifles units. 5th (Otago Hussars) Squadron. Cap badge: The coat of arms of Lieutenant-Colonel Joseph Cowie Nichols within a circle flanked by fern fronds and surmounted by the Imperial crown. Collar badges: The coat of arms of Lieutenant-Colonel Joseph Cowie Nichols over the regimental motto. Motto: Es fidelis (Be faithful). 7th (Southland) Squadron. Cap and collar badges: A sparrow hawk swooping on its prey. Motto: Celer et audax (Swift and bold). 12th (Otago) Squadron. Cap and collar badges: A fallow deer’s head surmounted by the regimental motto. Motto: For King and country. These squadron designations were intended to represent each of the three Territorial Force mounted rifles regiments from which the OMR drew its personnel. As far as possible, each squadron drew its recruits from its geographical region until September 1917. From then on, men were sent overseas as generic mounted rifles reinforcements but were still generally assigned to their region’s unit. We have 9 articles, related to Mounted Rifles units.